<Sharing instead of owning: carsharing with classic cars. How to drive the Legends you’ve always dreamed of. Jutting diagonally into the sky from the old port of Rio de Janeiro is an other-wordly edifice that looks like a cross between a solar-powered dinosaur and a giant air conditioning unit. The Museu do Amanhã (Museum of Tomorrow), which opens on Thursday, must already rank as one of the world’s most extraordinary buildings. But once the public starts to visit this weekend, it may soon also become known for one of the planet’s most powerful arguments for sustainability. Mixing science and art, the 230m reais (£40m/$59m) institution devotes itself to a topic that is divisive and often depressing: the need for change if mankind is to avoid climate disaster, environmental degradation and social collapse. For Mayor Eduardo Paes – who will inaugurate the building at a ceremony with President Dilma Rousseff – the museum is the most striking example yet of the regeneration and gentrification of Rio’s port district. Ten years ago this was one of the city’s poorest and most crime-ridden areas. Today it is in the midst of a vast redevelopment that should make it one of the most desirable areas in Rio. The overhead expressway – the Perimetral – has been demolished, new plazas have opened up, the poor have been driven out and the wealthy corporate residents, including Trump Tower developers, are being invited in. To attract them, a new Museum of Art was completed here two years ago. It is impressive, but the Museum of Tomorrow is on another scale altogether. 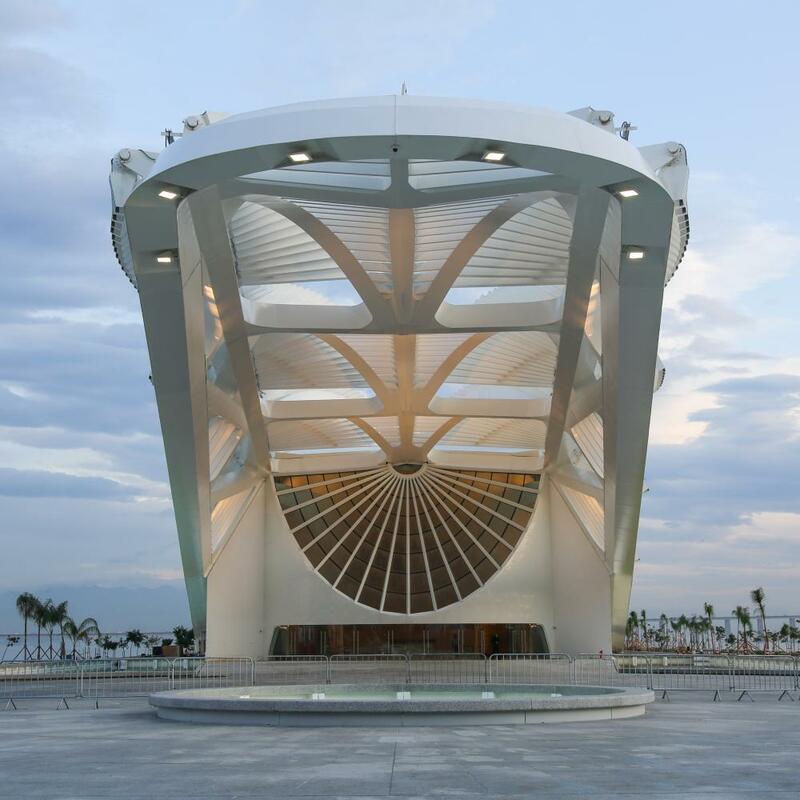 The structure – which was supposed to have opened before last year’s World Cup – looks set to be one of Rio’s most famous tourist sights. With solar spines that bristle above and a fan-like skylight below, it is designed to adapt to changing environmental conditions. 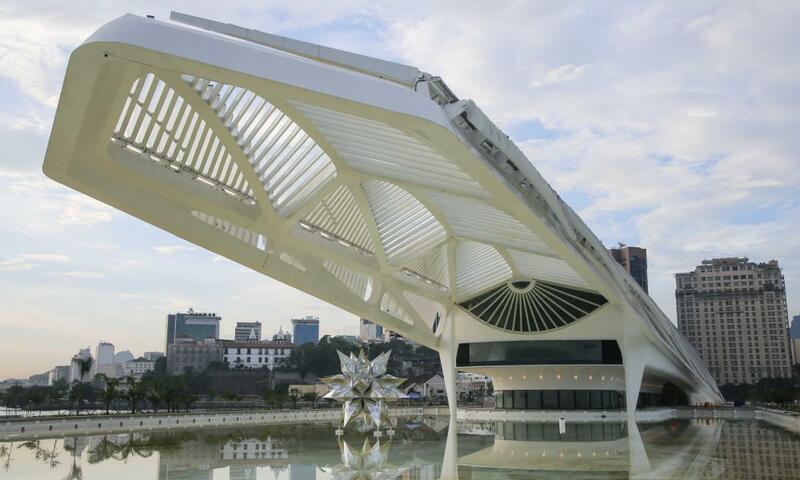 Catalan architect Santiago Calatrava says he was inspired by the bromeliads in Rio’s Botanical Gardens. Inside, however, the whitewashed curves are more reminiscent of the 1960s concrete modernism of Oscar Niemeyer. Funded by the Rio city government with support from sponsors, the building attempts to set new standards of sustainability in the municipality. Compared with conventional buildings, designers say it uses 40% less energy (including the 9% of its power it derives from the sun), and the cooling system taps deep water from nearby Guanabara Bay. Hugo Barreto, the head director of content, said the museum aimed to set itself apart from other science museums by editorialising about the near-term need for sustainability. “When people think of the ‘Future’, it usually seems very far away. That’s why we called the museum ‘Tomorrow’. It’s closer. It depends on what we do today,” he said. The main exhibition is almost entirely digital, focusing on ideas rather than objects. Asking questions about where we come from, where we are and where we are heading, it leads visitors along the 200-metre long hall through displays ranging from the origins of the planet to our possible futures. The journey is a little trippy, a little hippy, very worthy but almost never dull. The entrance is a “cosmic portal” containing a film co-directed by City of God director Fernando Meirelles that compresses 13.7bn years of geological change and natural evolution into eight minutes of sensory overload projected by nine projectors inside an egg-shaped cinema. This contrasts with the next three displays, which are more elegant and thoughtful, each housed within a giant cube with commentary in three languages (Portuguese, Spanish and English). The first is an ethereal installation commissioned from US artist Daniel Wurzel that conveys the flux of matter. This is followed by an immersion into biology, DNA and the connectedness of life within and without our bodies. The final cube takes us into the nervous system, human relationships and culture with 1,200 images arranged as pillars of prayer, sensation, relationships, home life and other themes. Next is the heart of the museum and its message – a Stonehenge-like cluster of 10-metre tall digital totems that literally overwhelm the visitor with data and images about where we are now: the Anthropocene, an era in which mankind has become a geological force. Standing in the centre of these huge screens and loudspeakers is an impressively discomfiting experience. Clips of burning forests, melting glaciers, dense traffic and Brazil’s recent toxic mudslide flash by, along with a real-time counter of global births and deaths, hockey stick graphs of ocean acidification, ozone depletion and greenhouse gas emissions, and the latest figures on consumption of energy, water and beef. The museum has partnerships with Brazil’s leading universities, global science institutions and collects real-time data on climate and population from space agencies and the United Nations. It has also hired consultants from a range of related fields, including astronauts, social scientists and climate experts. Projecting current trends 50 years into the future, the next three exhibits in the Tomorrows area feature interactive games that allow visitors to shape different futures. One measures the visitor’s ecological footprint and then calculates how many planets would be needed to support mankind if everyone on Earth had the same standard of living. Another is a collective Sims-type exercise in which four visitors make decisions – on energy sources, finance, land usage – that can enhance or diminish the survival prospects of humanity. Given its name, many will come to this museum expecting a sci-fi fantasy future of lasers, robots and space travel. They will be disappointed. There is no technology on display. The lives of coming generations will undoubtedly be influenced by nanotechnology, robotics, droids, artificial intelligence, geoengineering, hive minds, nuclear fusion and other staples of the commercially imagined future. The absence of any substantive exhibitions on these innovations underplays the role that industry will surely continue to have on our society. Yet it also allows for a sharper focus on human behaviour and a vision of the future that is different from those usually presented by wealthy, industrialised countries. So it is refreshing to find something different in Brazil, a country that is largely on the receiving end of innovation. Like other emerging economies with huge, fast-urbanising populations, the consequences are often environmental and social pain as much as economic gain. Fittingly, the displays concentrate on ecology more than technology, impact more than innovation. Given this outlook, the final exhibit is unsurprisingly not about travel to a galaxy far, far away, but instead a back-to-the-pre-modern-basics appeal for sustainable values. It is a wooden structure based on an indigenous house of knowledge where communities share stories. In the centre is the only physical object in the main hall – an ancient Australian aboriginal tjurunga, which is a symbol of learning, fertility, ritual power and the ability to cope with change. Sensors embedded in the structure around it adjust the lights and sounds in the hall according to the movement of visitors – another reminder of how individuals affect the world around them. From there, visitors exit via the rear of the building, where the glass walls look out over a “reflecting pool” on to one of the world’s most stunning and complex views – distant mountains, the polluted waters of Guanabara Bay, oil tankers, a warship, a plane flying into Santos Dumont airport, the vast span of Niterói bridge and the higgle-piggle of a city of 6 million people. In this all-too-real today, the museum’s vision of a better tomorrow feels both anomalous and important. As with the sustainability agenda as a whole, detractors will argue that the museum is filled with contradictions. It is reliant on sponsorship from conglomerates, such as British Gas, Santander Bank and the Roberto Marinho Foundation (which is part of the huge Globo media group) and it is at the forefront of a development that has forced many poor people from their homes. But for anyone who believes the biggest challenges facing our species are environmental rather than economic and that the most likely solutions are behavioural rather than technological, Rio’s Museu do Amanhã may come to stand out as one of the most engaged museums in the world.